This fall, the Brooklyn Navy Yard Development Corporation will open a new exhibition and visitors center at the Brooklyn Navy Yard Center at Building 92. Among the many items on display at this new museum will be an intricately detailed model of the 19th century ship of the line USS Ohio. The model was built by former Air Force officer Steven Myatt. He began construction of the model in 1998, making slow but steady progress in short weekly sessions of research and construction. One of the reasons it took so many years to complete the model is that Myatt’s work was meticulous. The primary plan he used to recreate Ohio was one drawn by Howard Chapelle in his book “The History of the American Sailing Navy.” This provided the body, sheer, and top deck plans. 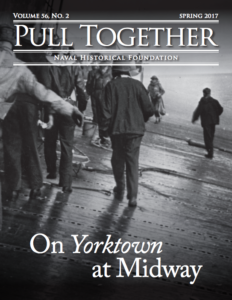 Myatt wanted the top two decks fully constructed, so he made a trip to the National Archives to obtain plans for the main gundeck – and anything else they happened to have handy. He was fortunate enough to find an interior sheer plan, a stern draught, a spardeck plan, the main gundeck plan, a plan for the ship’s boats, and a couple of plans showing the arrangement of the channels and upper gunports. For the figurehead, Myatt made a trip to StoneyBrook, Long Island to take photographs of the actual figurehead, on display in the Hercules Pavilion. But Myatt’s research did not end with these sources. From the memoirs of Roland Gould (“Life of Gould” published in 1867), he discovered that the companionway in front of the ship’s wheel was done in shining brass. Gould also supplied plenty of lower-deck scuttlebutt about the ship and current events. He also utilized official papers and memoirs written by Ohio‘s crew, including ship’s papers from the “Papers of Isaac Hull.” Myatt discovered that in April of 1841, Ohio fished up carronades from storage in the ballast and mounted them in preparation for war with England. 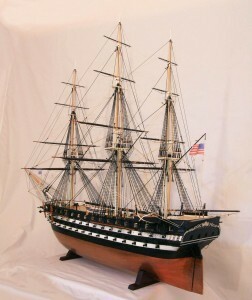 The model is set for April, 1841 and shows all guns mounted. Why did Myatt choose to build Ohio? 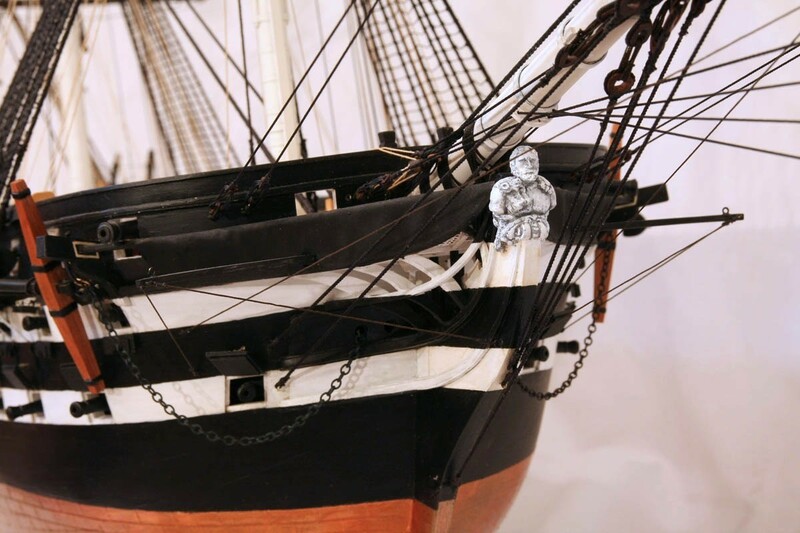 In his own words, “Ohio represents the pinnacle of sailing line-of-battle design.” This heavily armed, fast sailing, good looking ship was marveled at by crowds overseas during her service. USS Ohio was laid down in 1817 at New York Navy Yard. 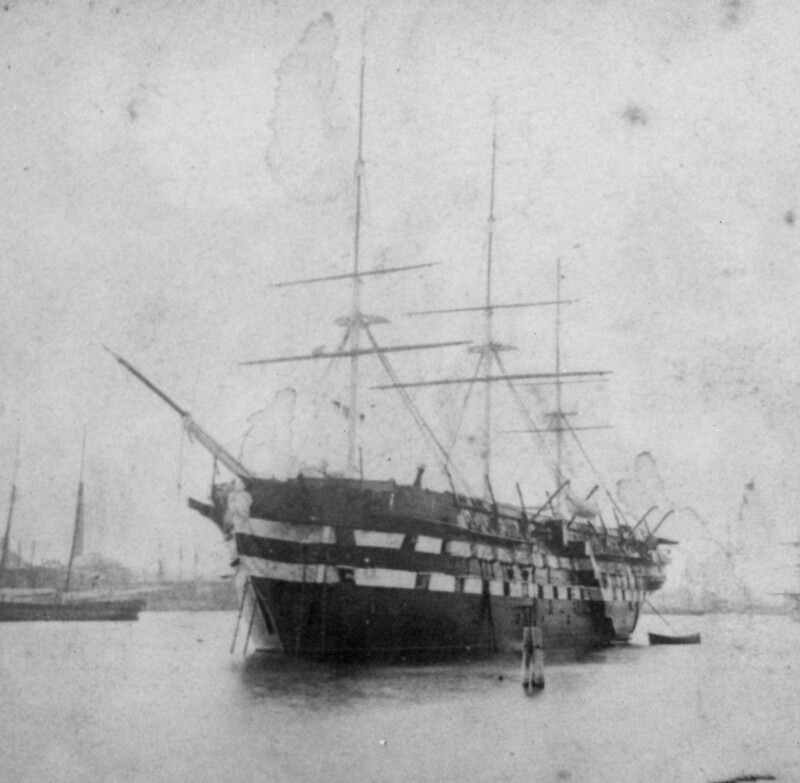 Launched on 30 May 1820, she spent her early years in ordinary, until refitted for service in 1838. She served as flagship of the Mediterranean Squadron for two years, including a role in suppressing slave trade off the coast of Africa. She went into ordinary again in 1840 at Boston, serving as a receiving ship. Recommissioned in 1846, she participated in the War with Mexico, landing guns at the siege of Vera Cruz, and lending 336 of her crew for the Tuxpan River Expedition. After the war, Ohio spent two years in the Pacific, and helped to keep order off California during the Gold Rush. She returned one last time to Boston in 1850, where she once again served as a receiving ship until 1875. She then went into ordinary and was sold off in 1883. In the process of being broken up, in 1884 in Greenport Harbor, NY, she broke from her mooring during a storm, and became stranded. She was burned to the waterline, and portions of her hull remain scattered and buried under the mud to this day. 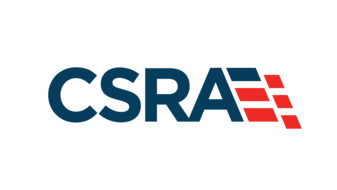 For more on Ohio‘s service, please visit the Dictionary of American Naval Fighting Ships page on the Naval History and Heritage Command website. A bit of trivia: Myatt always signs the inside of any ship model he makes. He signed his name and date on the cabin floor under the master table – now visible only to a mini-camera snaked in through a gunport. Myatt originally intended to donate the model to the National Museum of the United States Navy at Washington Navy Yard as a gift. But he was contacted last year by representatives of the Brooklyn Navy Yard, who asked if they could display the model in their new museum. As the Brooklyn Navy Yard Development Corporation is a private enterprise, Myatt agreed to loan them the model indefinitely. The Center at Bldg 92 opens later this year – if you have the chance to visit, be sure to give the Ohio model a close look. I am trying to locate as complete a set of Eckford’s building plans for the USS Ohio, from 1812 as are available. Any information on where I can locate them would be greatly appreciated. Perry, have you checked at the National Archives, “Records of the Bureau of Ships?” They do have records dating back to 1794. I currently own an actual antique builder’s model of an American 74. I would like to get in touch with Mr. Myatt. Al, we’ve sent a message to him on your behalf, we hope to put you in touch. Anyone with questions about the Ohio can contact me at myattmr2@yahoo.com. I found a wooden model of the U.S. FRIGATE Ohio 18th Century. It has the Cannons on the sides wth sails. Is this a rare ship model? I’ll have to check around on that because I don’t know. If anyone else does, feel free to chime in!